Late in the day Tuesday, United Airlines CEO Oscar Munoz finally issued what communications experts consider a true apology and a promise to ensure such an incident never recurs. But not before comedians and the public reacted negatively to Sunday night's events. The incident has also provoked a storm of discussion not just over United’s response, but about the customer rights of all airline travelers. 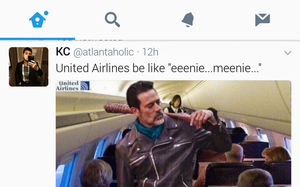 @atlantaholic posted an image of “Waking Dead” nemesis Negan walking through a United aisle, with the tweet, “United Airlines be like “eenie… meenie…,” suggesting he’d remove passengers with his baseball bat, Lucille. 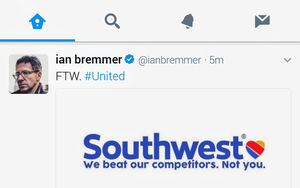 2 comments about "Is United Airlines (Expletive Deleted)? TV, Social Media Think So". Chuck Lantz from 2007ac.com, 2017ac.com network, April 11, 2017 at 4:31 p.m.
My own reason for avoiding United flights after seeing the video is simple; ... While I realize all airlines can make stupid decisions, do I really want to book a flight with an airline that made one so openly, and one that chose to forcibly eject a passenger instead of simply offering more money until someone accepted the offer? To me, it was a no-brainer. And United proved beyond any doubt that they acted brainlessly. Do I want them in charge at 30,000 feet in the air? Doug Garnett from Protonik, LLC, April 12, 2017 at 12:53 p.m.
Quite an event. But more concerning was that when I expressed a milder view than the outraged vigilantism that exploded in social media, good friends turned in anger - I suppose for spoiling the entertainment they were getting by beating up on United with suggesting that explosions of social media mob violence aren't terribly useful. What has happened to us as a society that we gleefully leap into rabid declarations without significant foundation in knowing the truth?